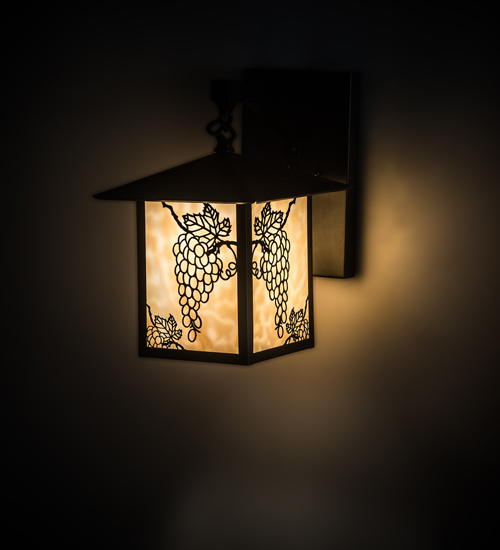 Description: A charming vineyard design comes alive as this delicately etched Solid Brass design features bunches of grapes with soft ambient light projecting through stunning Beige Iridescent Glass. The lens is complemented with Brass hardware featured in a Craftsman Brown finish. This Craftsman Signature fixture is ideal for both exterior and interior lighting applications and handcrafted by highly skilled artisans in our 180,000 square foot manufacturing facility at the foothills of the Adirondack Mountains. Custom sizes, colors, styles and dimmable energy efficient lamping options are available. This nature-inspired sconce is UL and cUL listed for dry, damp and wet locations.